S.B. Civil Misc. Appeal No.1626 of 2002. D/d. 21.8.2006. For the Appellant :- Rinesh Gupta, Advocate. For the Respondent :- None. R.S. Chauhan, J. 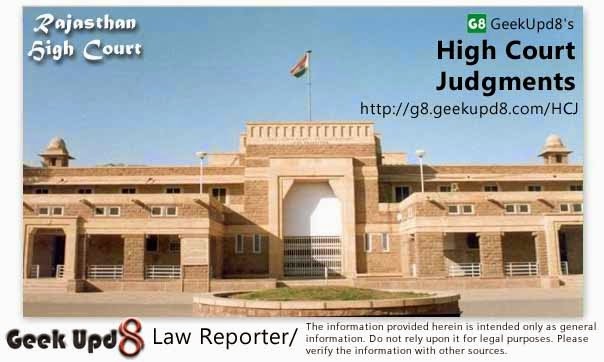 - The appellant has challenged the order dated 10.05.2002 passed by the learned Additional District Judge No.1, Sikar whereby the learned Judge has dismissed the application under Order 9 Rule 9 of the Civil Procedure Code (henceforth, to be referred to as the Code, for short). 2. The brief facts of the case are that the appellant, who is plaintiff in the suit, filed a suit against the defendant-respondents for declaration, partition and permanent injunction. According to the plaint, the appellant has been lawfully adopted by the defendant No.1 on Jeth Sudi 11 Samvat 2042 as per the rites of the Jat Community. According to the appellant, in this regard, an adoption deed was registered. After the said adoption, the appellant left his natural parents and started living with the defendant No.1. The defendant No.1 looked after his education and even got him married. The appellant further claimed that the residential property and the agricultural land belonging to the defendant No.1 are situated in Village Bidoli. But some persons, who are working against his interest, are trying to convince the defendant No. 1 to alienate the said property and deprive the appellant from his rightful shares. Hence, the appellant filed the civil suit. After service on the respondent-defendants, the case was fixed on 19.9.2000 for filing of the written statement. But on 19.9.2000, the counsel for the defendants assured the learned court that the parties would like to compromise and sought adjournment on this ground. Therefore, the learned court adjourned the case till 26.9.2000 and directed that the copy of the compromise be placed on record. Despite the directions of the learned Court, no compromise was placed on record, although a compromise was written and was kept with the counsel for the defendants. On 13.3.2001 the defendants counsel pleaded no instructions. However, as a compromise had been written, the appellant was under the impression that the same must have been filed in the court. In the absence of the compromise, in the absence of the defendants counsel, the learned Court had fixed 31-01-2001, 20-4-2001, and 28-4- 2001 as the date for the plaintiffs evidence. Since the defendants had assured the appellant that the compromise would be filed in the leaned Court, he did not contact his counsel as he was under a bona fide impression that the copy of the written compromise must have been filed in the Court. However, vide order dated 28.04.2001, the learned Court dismissed the suit on the ground of non-prosecution. Four months later, on 21.8.2001 when the appellant contacted hi s counsel, his counsel informed him that the suit has been dismissed vide order dated 28.4.2001. Immediately on 31.8.2001, the appellant submitted an application under Order 9 Rule 9 C.P.C. However, after hearing both the parties, vide order dated 10.5.2002, the said application was dismissed by the learned Court below. Hence, this appeal before this Court. 3. Vide order dated 27.9.2002, this Court had issued notices to the respondents and directed them to maintain the status-quo. According to the Registrys report dated 6.2.2003, notices have been served on the respondents. However, despite service of notice on the respondents, no one appeared on behalf of the respondents on 4.5.2006, 22.5.2006 and even today i.e. on 28.7.2006. Hence, we are constrained to decide this case in the absence of the counsel for the respondents. 4. It is a well-settled principle of law that where there is a wrong, there is a remedy. Such a remedy should not have been set-aside on the hyper technical views without considering the harsh reality of this country. The litigant, more often than not, is illiterate with regard to the law and the legal procedure. The learned members of the Bar are at times apathetic towards interest of the clients. They neither inform the clients about the progress of the case nor advise him properly about the steps that they need to take. Invariably, because of the lack of the communication between the client and the advocate, the client suffers. The case of the litigant is not presented properly. The evidence is not placed before the court and the uncaring advocate keeps the litigant in the dark. In such a scenario, the judiciary is expected to take notice of the reality of the judicial system, the reality of the society at large and to be liberal in restoration of the suit, which have been dismissed for non-prosecution. But, this is not to say that every case dismissed for no n-prosecution or under Order 9 Rule 13 C.P.C. should be restored automatically. However, in cases where the litigant has been vigilant under his limited capacities, where the advocate has been at fault, where the litigant is not intentionally trying to avoid the judicial process and considering the facts and circumstances of each case, the court should lean towards the restoration of the suit. After all, the right to be heard, the right to a remedy is a constitutional right of every person. Therefore, the trial Courts should hesitate to dismiss an application under Order 9 Rule 9 C.P.C. as a knee-jerk reaction. 5. In the present case, the appellant, who is allegedly an adopted son, had deposed faith on the defendant No. 1, who is the adopted mother, and had gained the impression that the compromise entered between them must have been submitted before the learned Court. His advocate, who was duty bound to inform him that no such compromise has been submitted, failed to do so. Even though, the learned advocate was present on 28.4.2001 when the case was dismissed for non- prosecution, he did not bother to inform the appellant till the appellant contacted him. However, for the fault of the lawyer, the client cannot be made to suffer. Therefore, the learned Judge should have realised that there is a sufficient cause as the appellant, who is staying far away, has no knowledge as to what has transpired in the court. Immediately after coming to know, in order to protect his interest and right, the appellant had filed the application under Order 9 Rule 9 C.P.C. Such promptness clearly shows the vigilance with which the appellant was working. He could not be expected to approach the court earlier as he had no knowledge that the compromise has not been submitted and the case has been dismissed. 6. Therefore, in the interest of justice, this Court is inclined to quash and set aside the order dated 10.5.2002 and to direct the learned Court to restore the civil suit to its original number to proceed from the point where the trial had reached prior to the dismissal of the suit. With these observations, this appeal is allowed. Appeal Allowed - Suit Restored. Civil Procedure Code, Order 9 Rule 9 - Appeal against order refusing to restore suit dismissed in fault. Counsel did not inform the plaintiff - Fault of the counsel should not prejudice the party - Application for restoration was filed immediately on getting knowledge of dismissal of the suit. Petition allowed.